The rebuilding of the South after the Civil War brought industrialization, urbanization, and technological advances to rural American farms. "Never Isn't Long Enough" captures how these transformations affected the romance between a young farm girl and a wealthy older man called to God and commerce. "Life on the farm, the coming of the automobile, moonshiners, the Roaring Twenties, the movie house ... they're all here! The Civil War had a devastating impact on the south. 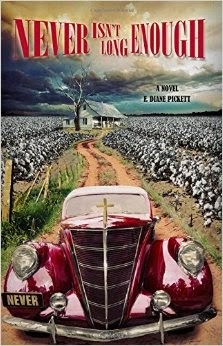 Author F. Diane Pickett has written an entertaining and informative novel about the aftermath of war and the rebuilding of lives and the restoration of the American south. Based on her own family history, we see the south through the eyes of characters who were forced to endure and adapt and progress. At times poignant, at times humorous, there is plenty of historical detail and accuracy that brings the era alive. At the heart of the story are a manly mountain man named Pick and a young adventurous woman named Faye. At times, the novel reads more like non-fiction than fiction, however the tale is so endearing, it kept me reading to the end. A nice historical story!